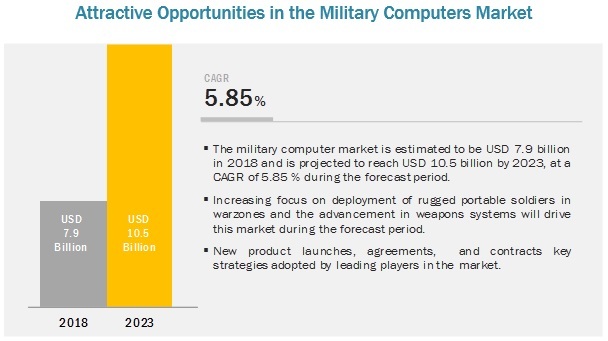 [169 Pages Report] The military computers market is estimated at USD 7.9 billion in 2018 and is projected to reach USD 10.5 billion by 2023, at a CAGR of 5.85 % from 2018 to 2023. The factors expected to fuel the military computers market growth is the increasing focus on deployment of rugged portable and wearable computers in military warzones. In addition, advancements in warfare technologies and modernization of military weapon systems are also expected to drive the market during the forecast period. By type, the rugged segment is expected to grow at a higher CAGR during the forecast period. 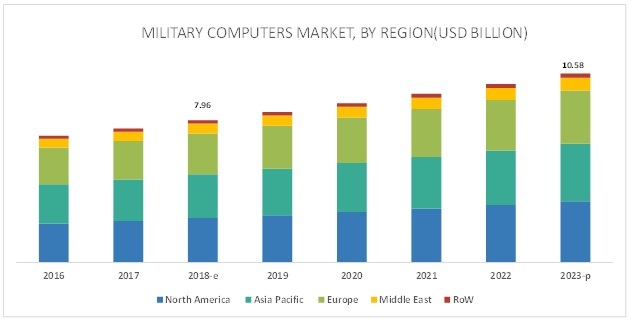 The rugged segment is projected to grow at a higher CAGR during the forecast period due to the significant demand for rugged computers and wearables by militaries across the globe. The militaries are focusing on more portable and technologically-advanced computers to be deployed on warzones. Ruggedness of military devices such as laptops, handhelds, and wearables is necessary to survive and function properly in extreme environmental and operational conditions. The wearable subsegment is expected to lead the rugged segment of the military computers market from 2018 to 2023. Militaries around the world are showing interest in wearable computers for delivering fast and accurate information to soldiers on ground. Wearable systems not only help in tracking real-time data about soldiers easily but also in tracking the health of soldiers. The easy portability and accuracy in terms of information transfer are expected to drive this segment in the near future. Wearable technologies enable soldiers to either track or be tracked in real-time and great precision – which ensures their safety as well as diminishes the chances of failure in high-risk operations. Also, the easiness with which these devices can be carried by soldiers in warzones makes these devices preferable. The aircraft segment to grow at the highest CAGR among the different platforms of military computers market from 2018 to 2023. Based on platform, the military computers market has been segmented and analyzed in terms of embedded computers deployed on different platforms, namely, aircraft, naval, and ground. The high procurement of military aircraft around the world and advancements in military aircraft technology are expected to drive the market for aircraft platform at the highest CAGR during the forecast period. The North American region is expected to dominate the military computers market from 2018 to 2023. The North America military computers market is expected to grow at the highest CAGR during the forecast period. This growth is due to the high military budget of the US and high level of sophistication and advancements in the technology of US military defense systems. s the US Army uses advanced systems, the scope of adoption of embedded computers is high. The undergoing R&D for the military weapons and equipment for the US Army would also drive the adoption of military computers. Major players in the military computers market include Curtiss-Wright Corporation (US), Zebra Technologies Corp. (US), Cobham plc (UK), Saab (Sweden), Rockwell Collins, Inc (US), Thales Group (France), Northrop Grumman Corporation (US), Getac Technology Corporation (Taiwan), and Panasonic Corporation (Japan), among others. Curtiss Wright: Curtis Wright is continuously expanding its product offerings in the aircraft computers market through research and development. It is also spending heavily on the upgradation of existing products and adding new and improved capabilities such as software and processor. It has entered into strategic partnerships with various companies such as Lynx Software, Green Hill Software, Intel, Nvidia, etc., which helps increase its customer base. The company’s acquisition of Teletronics Technology also strengthened its position in the military computers market. Cobham: Cobham recorded an outstanding operating performance in 2017, with a revenue of USD 2.39 billion. The company’s strategy for sustainable long-term growth aligns with the emerging global trends, drive for information, and demand for efficiency and cost-effectiveness. The company has strengthened its position in the military sector through innovations, strategic partnerships, and a wide range of reliable product offerings. Cobham also provides on-field services for off-site testing at customer premises. Saab AB: Saab offers a wide range of embedded ground computers. As a part of its growth strategy, the company majorly focuses on technological development and working constantly to shorten lead times and increase production efficiency. The company does business around the world and has good relationships with customers and other stakeholders on every continent. This would the help the company continue growing and receiving major contracts from governments of various countries across the globe. In 2017, Saab received an order from the Swedish Defense Material Administration (FMV) to deliver Trackfire Remote Weapon Stations (RWS) to the Swedish Navy from Q3 2018 to Q3 2019. In May 2018, DRS received a USD 842 million deal to deliver new rugged tablets for Army Battle Command Platform. In August 2018, General Dynamics received a contract from the US Army to provide rugged Commercial Off-The-Shelf (COTS) computers and networking equipment modified for military operations. In October 2017, Curtiss Wright launched a new family of rugged pre-integrated avionics computers. The new computer system features an extensive range of field-proven rugged chassis (2-6 3U OpenVPX slots) pre-integrated with safety certifiable modules, including Single Board Computers (SBC), graphics controllers, and avionics I/O cards. In June 2017, Raytheon received a contract worth USD 600 million from the US Army for the upgrade of software on missile defense and other strategic systems. What are your views on the growth perspective of the military computers market? What are the key dynamics and trends, such as drivers and opportunities, that govern the market? What are the key sustainability strategies adopted by leading players operating in the military computers market? What are the new emerging technologies and use cases disrupting the military computers industry? Which are the key applications where military computers play a significant role? What are the key trends and opportunities in the military computers market across different regions and respective countries? 9.3.1.1 The Advancements in the Fields of Military Automation and Increasing Investments in R&D is Increasing the Market for Military Computers in UK. 9.3.4.1 Tensions With Ukraine and Other Nato Countries and Contracts Received From Developing Countries for Military Equipment’s is Increasing the Market for Military Computers in This Country. 9.3.5.1 Rapid Militarization in the Region By Newly Added Nato and Allied Countries is Expected to Drive the Demand for Military Computers in Countries Such as Ukraine, Poland, and Other Small Nations. 9.4.1.1 Increasing Focus on Modernization of Soldiers and Heavy Investment in Military Assets and Research & Development for Military Segment is Set to Drive the Market for China. 9.4.2.1 Large Number of Defense Contracts Signed By India for Procurement of Defense Equipment’s is Set to Drive the Market for Military Computers in India. 9.4.3.1 China’s Attempt to Militaries the South China Sea is Forcing Japan to Increase Its Military Capabilities. This is Set to Increase the Military Computer Market for Japan. 9.4.4.1 Rising Defense Spending is Driving the Market for Military Computer in Australia. 9.5.1.1 Increasing Counterterrorism Activities in the Country and Rising Defense Exports of Military Hardware and Systems are Driving the Military Computers Market in the Country. 9.5.2.1 Increasing Investment in Military and Tension Between Iran and Saudi Arabia is Factoring the Demand for Military Computers in This Country. 9.5.3.1 Modernization of Defense Forces and Counterterrorism Measures are Driving the UAE Military Computers Market. 9.5.4.1 Growing Unrest in Middle Eastern Countries is Expected to Drive the Military Computers Market in These Region. 9.6.2.1 The Growing Adoption of Military Computers By Brazilian Defense Forces is Expected to Drive the Growth of the Military Computers Market in Latin America. 9.6.3.1 Rapid Militarization and Rising Concerns Regarding Terrorism are Expected to Drive the Growth of the Military Computers Market in Africa. The study involved four major activities to estimate the current market size for military computers. Exhaustive secondary research was undertaken to collect information on the market, the peer markets, and the parent market. The next step was to validate these findings, assumptions, and sizing with industry experts across the value chain through primary research. Both, top-down and bottom-up approaches were employed to estimate the complete market size. Thereafter, market breakdown and data triangulation were used to estimate the market size of segments and subsegments. The military computers market comprises several stakeholders, such as raw material suppliers, processors, end-product manufacturers, and regulatory organizations in the supply chain. The demand side of this market is characterized by various end users, such as military organizations and commercial buyers. The supply side is characterized by advancements in USV technology, development of USVs, and software development. Various primary sources from both, the supply and demand sides of the market were interviewed to obtain qualitative and quantitative information. Following is the breakdown of primary respondents. After arriving at the overall market size using the market size estimation processes as explained above the market was split into several segments and subsegments. To complete the overall market engineering process and arrive at the exact statistics of each market segment and subsegment, data triangulation and market breakdown procedures were employed, wherever applicable. The data was triangulated by studying various factors and trends from both, the demand and supply sides, in the military computers market. This research report categorizes the military computer market based on type, platform, and region.